One of the most versatile, natural fibres on the planet, sheepskin is used every day in our workshop to create beautifully unique handcrafted products. What we have found is that both we and our customers alike, love the variety of properties that the material provides. 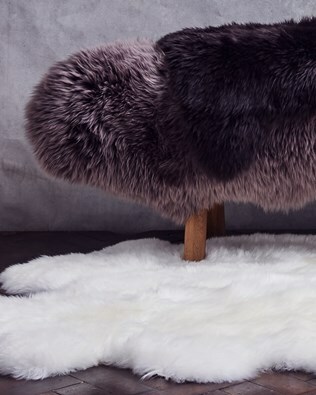 One of our most popular staple pieces for the home is our sheepskin rug. Produced in 3 colourways; Ivory, Vole and Dark Chocolate and 4 different size variations, these products have truly stood the test of time. The rugs have proved longevity in regards to both durability and popularity with our customers, both loyal and new. This year we've sourced rare styles to make our range bigger than ever, shop the collection here. To celebrate we've answered a few of the most popular questions we are asked on these beautiful pieces. How do you style sheepskin rugs? The classic style and sophistication that these statement pieces can bring to the home adds an instant touch of endless chic to any living space. Whether it’s slouched over an arm chair for extra comfort and warmth or lain across a wooden floor, our sheepskin rugs have the ability to revamp the interior of any room in seconds. Crafted in neutral tones, these rugs are designed to be beautifully understated and their earthy colour palette is intentionally timeless. Style your rug with similar tonal skins and fabrics, or make a statement with bold clashing colours and prints. Sheepskin rugs are one of the easiest ways to give your rooms an instant style boost. How are sheepskin rugs made? Here at Celtic and Co, we only use the finest skins to construct our rugs. Each piece is carefully selected and matched on colour and size. It is then down to a team of experienced craftsmen to align the interior edges and stitch each piece into place. By leaving the edges uncut, we are able to promote the variations and individuality of each piece of skin, whilst presenting them together as one, hand constructed and truly unique rug. How do you clean and care for sheepskin rugs? Our products are made from the finest quality, 100% sheepskin therefore caring for your rug has never been so easy. Simply shake outside and brush with a wide tooth wire brush for basic maintenance and when those accidents do happen, spot clean your rug with a damp cloth. These natural fibres have a barrier to protect from dirt and day-to-day wear, however these simple steps work towards the preservation of your product. We always advise avoiding direct sunlight and damp rooms as these rugs are dry clean only. If you have any queries about the care instructions of our rugs, or any other product, please don’t hesitate to get in touch with our team. Can sleeping on sheepskin benefit my child? Familiarising children early with sheepskin can have great benefits. It has been reported that babies who sleep on sheepskin rugs are less likely to develop Asthma by the age of 10 and the luxurious natural fibres in sheepskin allows the body to retain heat in the winter and stay cool in the summer. This enables both parents and children to enjoy each special moment they spend out and about. As safety and quality has always been the longstanding focal point of our children’s collection, please note that it is strongly recommended that babies under the age of 1 should sleep on a firm mattress without a sheepskin lining. Certain studies have highlighted a correlation between sleeping on sheepskin and an increased risk of Sudden Infant Death syndrome. With this in mind our collection is designed with comfort and play at the heart of each and every piece. 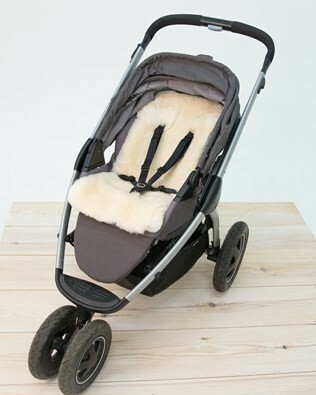 Our sheepskin pushchair liner is created to keep your little ones warm and comfortable during days out. The Flatout Bear is a tactile teddy bear that allows engaging interaction with the natural sheepskin fibres. Additionally, our baby collection also includes the infant fleece. This makes the perfect machine washable play mat, all year round. Please seek the latest and most reliable advice for further information and peace of mind before purchasing our products.